This Opal necklace has a slightly transparent caramel coloured solid Ethiopia Wello Opal with red flashes for a classic, understated look. The opal is secured in a sterling-sliver mount and is enhanced with a sterling silver flower with a clear Swarovski AB crystal bead on the stem for extra sparkle. 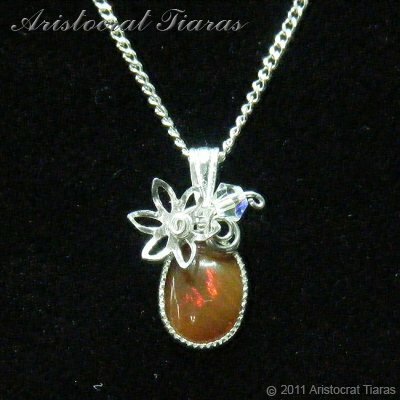 This handmade necklace from Aristocrat Tiaras is part of our Opal jewellery collection for a lady to enhance her outfit or makes a great gift for any special occasion!